The Arlington County Board today voted to adopt a Four Mile Run Valley Park Master Plan and Design Guidelines. The plan includes a comprehensive Master Plan for Jennie Dean Park and Shirlington Park, with short and mid-term recommendations for maintaining and improving Shirlington Dog Park. Development of the plan, which covers the parks clustered along Four Mile Run and its environmentally sensitive riparian areas, was guided by the Four Mile Run Valley Policy Framework, adopted by the County Board in May 2018. The policy framework included final concept designs for both Jennie Dean Park and Shirlington Park. Four Mile Run Valley Parks map. The Board voted unanimously to adopt the Four Mile Run Valley Park Master Plan and and Design Guidelines. Design Guidelines associated with the Master Plan detail both unifying and park-specific design recommendations. Universal design; safety and comfort; stormwater management; tree canopy and shade improvements; park furnishings; public art, and other common improvements will be included. 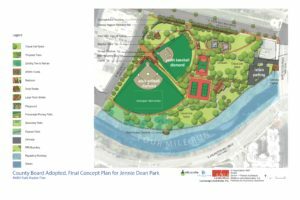 A two-phase plan for Jennie Dean Park, named for Jennie Serepta Dean, founder of the Manassas Industrial School for Colored Youth, will replace all existing park elements and reconfigure them. Several new parcels will be incorporated into the park to create a strong frontage along South Four Mile Run Drive. Most of the park elements will be moved out of the Resource Protection Area (RPA) along Four Mile Run, and new casual use space will be created throughout the park (providing for areas of unprogrammed use, additional tree canopy and landscaping). The first phase of the redesign and construction will accommodate all the existing park features in its redeveloped arrangement, except for a second lighted tennis court (to be built during the second phase). The first phase is funded in the Fiscal Year (FY) 2019-2028 Capital Improvement Plan (CIP). In the first phase, a lighted tennis court and a lighted basketball court will be installed. Two lighted diamond fields will be located on the west side of the park along South Nelson Street and a playground will be located just south of South Four Mile Run Drive. In the center of the park, there will be a lighted basketball court, one lighted tennis court, restrooms and two picnic shelters. Other Phase One improvements include parking on the east side of the park, frontage improvements and casual use space along S. Four Mile Run Drive and several new entrance gateways. The second phase, to begin after more parcels on the northeast portion of the site can be acquired, will relocate the lighted basketball court to its new location south of the playground, and the second lighted tennis court will be installed within the lighted basketball court’s first-phase location. Casual use space will be expanded during the second phase, and a new entrance gateway will be built on the northeast corner along South Four Mile Run Drive. 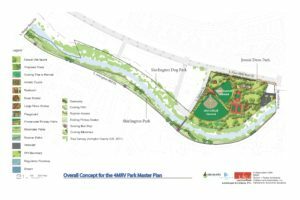 The Shirlington Park master plan calls for pedestrian-friendly riparian access paths and overlooks of Four Mile Run within the 11.5-acre park along Four Mile Run Trail. Additional tree canopy, landscaping, and other associated amenities will be provided. Shirlington Dog Park will keep its existing size, configuration and character, with improvements recommended over time. Over the short-term, medium-term and long-term, minor physical improvements are recommended within the park. They will address erosion and water quality issues, including discontinuing mowing along the fence line to increase plant buffers and stabilize bare soil, and more plantings along the stream bank. More will be done to protect trees. More trash receptacles will be provided and signage and public education will be improved. Access to the stream will be limited to defined points. Some 65 meetings were held under the Four Mile Run Valley Initiative, which includes the Park Master Plan process. The County Board held a work session in May 2017 to review progress and address specific questions; the Board also held a second work session in February 2018. The final design process for Jennie Dean Phase I will begin later this year and involve the public in developing specific park design elements, including the playground, casual use space, landscape/hardscape design, public art and more. With community input the park design will celebrate Jennie Dean Park’s rich African American, recreational, industrial, and natural histories. This public engagement process will follow the County Manager’s Six-Step Public Engagement Guide for Capital Projects at the “Involve” level. To learn more about the Master Plan for Four Mile Run Valley parks, and the extensive community process to develop the plan, visit the County website. Scroll to Item No. 61 on the agenda for the September Regular County Board Meeting. A 90-day deferment is meant to produce further changes to Virginia Hospital Center's proposed expansion plan.